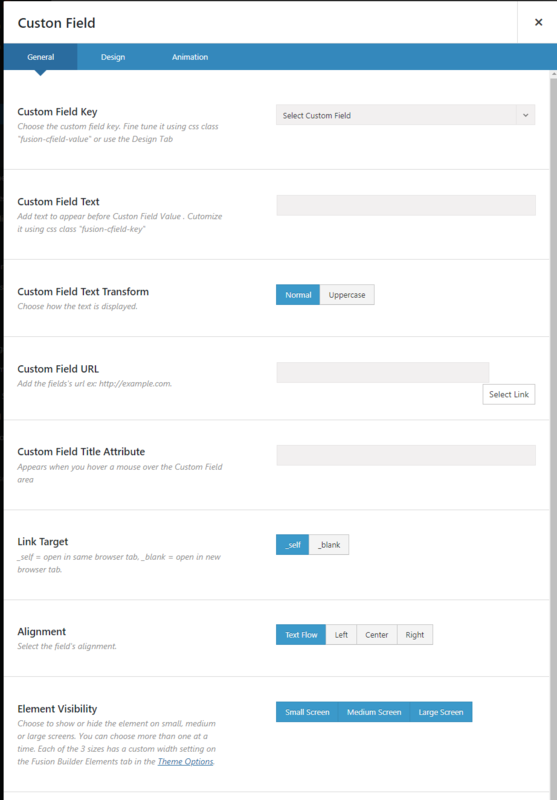 Single Page Custom Fields is a WordPress plugin for the Fusion Builder, used by Avada theme. This plugin adds a new element called Custom Field. This element is similar to the Button element in a way that it has similar design options. But instead of the button you choose the custom field to show. If design options are not enough, you can also customize the custom field using css classes like most of the Fusion Builder elements. Please see the demo to see how your Custom Fields may look like. 6. Limited ACF support. The element can display any text or number custom field, even if it is created by ACF plugin. Advanced non-text formats may not work properly. After installing the plugin, create a new Page or go to modifying the existing one. 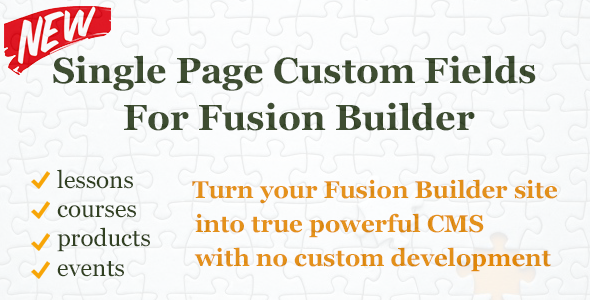 Make sure that Fusion Builder is used to edit a Page. Go to the Elements menu of the Fusion Builder and choose the Custom Field element. 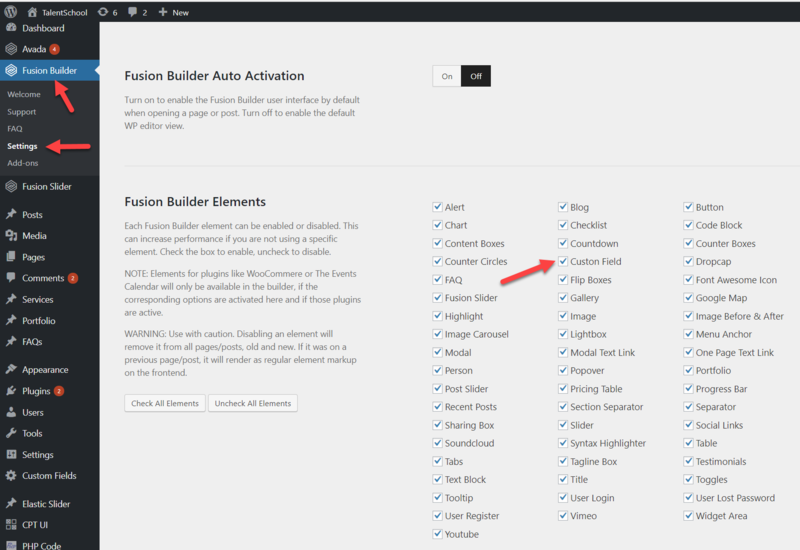 If you do not see that element make sure it is enabled in the Fusion Builder -> Settings menu. To put a custom field on the Page or other Custom Post Type entry add a Custom Field element from the Fusion Builder elements menu like you add any other element. Open element options and choose the custom field you want to show. You may create a custom field using either the standard WordPress method or create it using Advanced Custom Field (ACF) or other plugin. Please note that only text/number custom fields are guaranteed to work properly. Other types like image may not work correctly. After you choose the custom field you also can add some text to appear right before the custom field value, add a link to the custom field value and configure other option. The list of element’s option is below. You can also configure look and feel of the custom field using numerous design options or fine tune it with css if you feel comfortable to do so. Most of the design options are similar to the Button element. 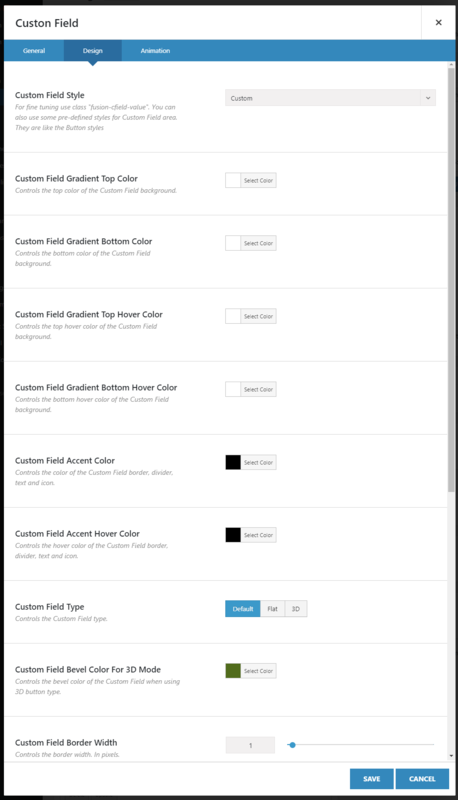 To design your custom field, you may use Design tab of the element’s options. If you need further fine tune the design you may use the class names that you find under the “Custom Field Key” and “Custom Field Text” descriptions. If you want some custom fields to have the absolutely unique design you may assign unique classes to both Custom Field Text and Custom Field Key. To receive the quick support please send us the question either via the contact form from our website of by e-mail support@amunet.biz. We will reply within one business day. Please feel free to contact us if you have questions related to the custom fields in general. We will try to advise you on the best solution for your case.